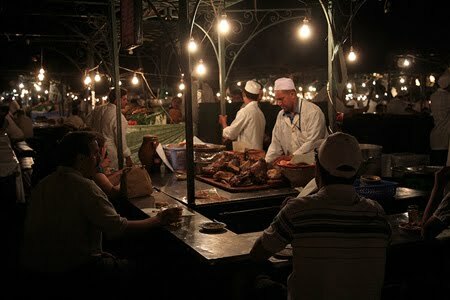 At dusk hundreds of food stall vendors start setting up in Marrakesh’s Djemma el Fna. By the time the sun goes down a full on feast is in full swing well into the night. Do you sample street food when traveling? I love how street food reveals the essence of a place. It really depends on where I am if I sample street food because I have a sensitive stomach. If it's a must do, like acaraje in Brazil, then I'll try it just for the experience. yep - love the street food here in Mexico...and the other place I love for street food is Thailand.. Fly Girl, If you have a sensitive stomach street food can be tricky. Catherine, Mexico is a great street food place. This looks like an exciting event.